I did mention that my favorite makeup purchase last weekend was this. I was walking at the new and improved Beauty by SM on my way to buy knee-high socks and some scarves when I saw that the Maybelline stall had an ongoing sale. Originally priced at Php 299, the sale bumped down the post at Php 209 which is very, very good in my book. The SA recommended that I get the one in Rose White. 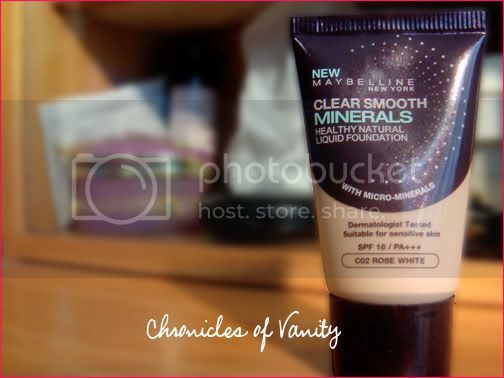 Clear Smooth Minerals Liquid Foundation is breathable yet full coverage that gives a healthy luminosity. A little background: I used to pretty much skip on liquid foundations, except when I need to pile on foundation during weddings and photo shoots at work. Never have I really included liquid foundation to my daily regimen cos 1) It's just an extra step. 2) Methinks it'll just make me oily with me being in in a tropical country and all. I've read about Shen's Glowing Shen post months back and I did promise I will try the product out because I was completely amazed how the foundation made Shen look simply divine. Consistency. It was neither thick nor runny so for me, it was perfect. I find that thick foundations usually are hard to blend and liquid ones usually provide little to no coverage. This baby was just in between. Just like it claimed, it was clear and smooth. The coverage made my minor blemishes disappear and it evened out my skintone. I used to not like Maybelline foundations (the powder ones, at least) cos they never seem to have a light shade perfect for me. This liquid foundie's shade is perfect, too! Non-sticky. Maybe it was just the weather but who cares? This foundation didn't make me feel the least bit sticky, and it dries up (to powder finish) pretty fast! No smell. I really am not a fan of make up with strong fragrances and this one is a winner with no smell at all. SPF! It has SPF 18 which is an is just a bonus, really, cos I never really rely on makeup to do something else's job. The price and the packaging. Some might say that it is incredibly small that's why it's inexpensive but to me this is a pro. Liquid foundations are one of the cosmetic products with a short shelf life and unless you're a celebrity who goes under the lights every day, a few pea-sized dollops are all you need because..
No touch ups. I've used this for a whole week under my HG mineral foundation and I'm very happy to report that my oil-blotting film usage did not go up nor did I had to retouch during the day. Fusion. Mineral makeup in a traditional medium? I'm sure MMU enthusiasts are rejoicing cos it's definitely not messy! Locally available. I got mine at Beauty by SM so that means this is available at all SM beauty sections! Easy to apply. 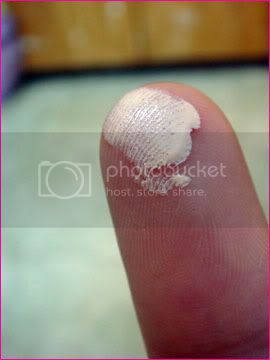 I tried using my Venus and Mars Foundation brush and some wedges and even a sponge but it all boiled down to my fingers. If you're using your fingers though, don't forget to make sure they're clean. I DID NOT break out with this. Yay! The need for concealer. Maybe I'm just expecting too much from this product when in fact it never promised to hide every flaw in my face, ha! Just four shades? I don't know why Maybelline has always been sticking with just 4 shades, all of which seems to have been from the same color family. Nothing else, really. This a great drugstore brand makeup and I'm glad that Maybelline has been doing much efforts to bring quality into drugstore buys. Is it HG material? Oh yes! And I will most definitely buy again when I run out. Mine is great, great, great!